My Early Steps™, a soft structured baby walker, was named among the best in family-friendly products by the Mom’s Choice Awards® program. It was recognized with a Gold award in the Gear & Accessories – Walkers & Jumpers category. 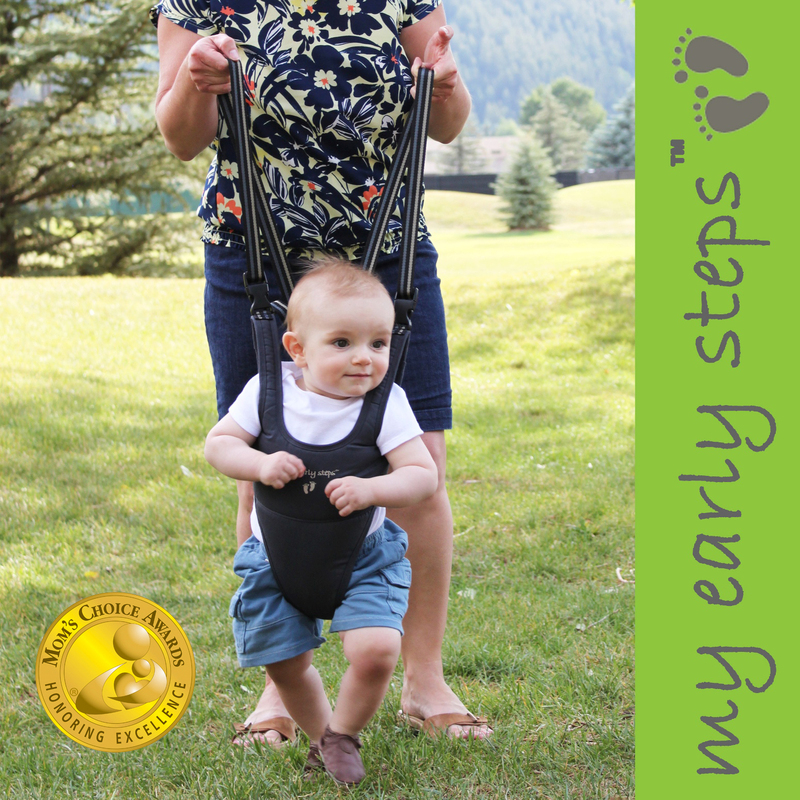 My Early Steps™ offers parents and babies everywhere a more natural approach to learning to walk. Its thoughtful design eliminates the safety issues and the inhibition of motor skills development related to traditional walkers on casters and wheels. The product incorporates a number of unique features which elevate it as a safer and more versatile alternative. My Early Steps™ is made by Little Dundi, based in Estes Park, CO. Little Dundi brings to life products inspired by baby and created by mom. Hannah has been a faithful user of My Early Steps™ for the last few months...even though a lot of her peers are walking, she has yet to walk unassisted. At first, she confused My Early Steps™ for her Jolly Jumper, but then she realized she was mobile in this device! She likes looking at her feet, and I like not having to hunch over to help her walk, saving my back. When I was little I had a walker with wheels - this product is now banned in Canada. Thankfully, My Early Steps™ has been approved by Health Canada to help parents out. Promotes baby’s natural arms posture – since baby’s hands are not held by an adult they remain in the natural posture necessary for balancing while transitioning from one foot to another. Doesn’t block baby’s view of feet – baby benefits from a good visual feedback loop during practice walking sessions. Baby gets used to this visual feedback and becomes more confident. Adjustable size – a three-point fastening on the back ensures an appropriate fit for babies of most sizes – whether an infant is wearing multiple layers of clothing or is taller than the average, the design of the walker will allow for a snug fit. The holding straps are adjustable in length to accommodate adult caregivers of various heights. Positioning of the adjustable length holding straps – the holding straps of the baby walker are attached to the lower part of the shoulder bands and do not rub against the baby’s ears and irritate baby during use. Fastening and controls are situated close to baby’s center of gravity – infants are top heavy with their center of gravity higher than that of adults. The location of the fastening and attachment of the holding straps close to baby’s center of gravity assist with a better weight distribution. The elongated part provides essential structural support for baby - it prevents the top of the baby walker from gathering up under baby’s arms by absorbing most of baby’ weight. Removable straps – babies learning to walk can easily tire after only 10-15 minutes and decide to switch to crawling for a while. With the straps removed it is possible to leave the baby walker on baby during periods of rest without undue risk of entanglement. When baby is ready to return to walking practice, the straps can be snapped back in place. The Mom’s Choice Awards® (MCA) is an international awards program that recognizes authors, inventors, companies, parents and others for their efforts in creating quality and family-friendly media, products and services. Parents, educators and retailers look for the Mom’s Choice Awards® Honoring Excellence seal of approval when selecting quality products for children and families. An esteemed panel of judges includes education experts, parents, children, producers, medical and business professionals, authors, scientist and others. My Early Steps™ is available for purchase at littledundi.com, amazon.com, walmart.com, wayfair.com and a growing number of specialty juvenile stores. But TWO lucky YYZ Bambina readers will win My Early Steps™! Open to Canadian Residents who are the age of majority only. Valid entries only. Contest ends May 28, 2013. For further contest rules, refer to the Terms and Conditions within the Rafflecopter. Disclosure: I received My Early Steps for the purpose of this review. As always, the language and opinions on this blog are my own. I will use it for my son! I would totally try this for Isabelle. She, too, hasn't taken her first steps yet on her own, but does walk holding my fingers. My poor back!! Really cool! I wish I knew about it when my boys were learning to walk. I didn't walk until 15 months. I'm sure this would have saved my parents' backs. Great idea. this would be perfect for my baby girl, she's going on 9 months. This would go to my cousin. I would use this with my youngest, who's at the mist of walking now. I'd keep it for my son who is 5 months old right now. I would give it to my cousin who just had her first baby. I wish I had this when my kids were learning to walk. Spent months hunched over and had many days with a sore back. I would give it to my cousin if I won. My friend for her babyshower. A friend that is expecting her first child soon. I would give this to my daughter for my youngest granddaughter who just turned 6 months. I'm not really sure at this time, I know a couple of people that I would like to gift this to. My son is 9 months old so I will use it with him. My nephew is the first one who get it if I win. My nephew is just about ready for this!